The signs of inflation continue to appear in the economy. The Fed is ignoring this because the Fed is afraid of deflation… despite food prices, energy prices, healthcare costs, home prices and stocks soaring. • FedEx is increasing prices by 42% for some shipments. • Commonwealth Edison is raising electricity rates by 38% in June. • Chipotle is raising prices for the first time in three years. • Netflix is raising prices on new customers. • Colgate-Palmolive is raising prices. These are simply explicit price increases. Many companies have been raising prices via a “stealth” price hike by simply charging the same price for less of a product. The latest example of this is bacon, but companies such as Kellogg’s, Snickers, Tropicana, Bounty, Heinz, and others have been using this tactic for some time. Against this backdrop, the Fed is openly stating that it wants to create inflation. Put another way, the Fed is not only oblivious to the fact inflation is already appearing in the broader economy, the Fed actually wants to create more inflation! 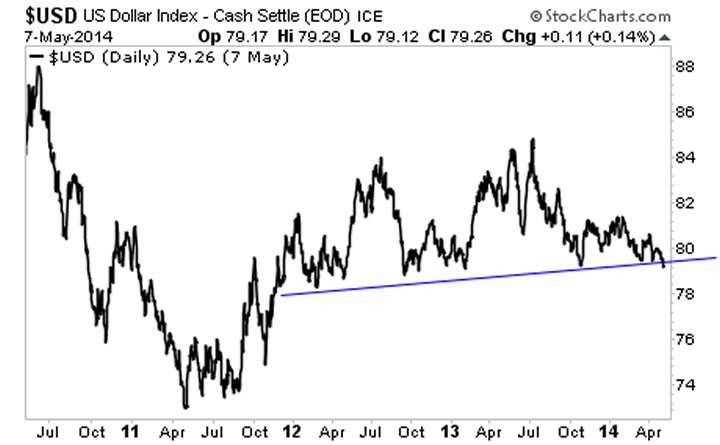 Small wonder the US Dollar is teasing with breaking multi-year support. In its quest to fight the brief deflation of 2008-2009, the Fed has unleashed a wave of inflation. These developments take time to unfold. But the signs are already there. The grand theme for 2014 will see prices moving higher. The problem with inflation is that it is a lot easier to create than contain. The Fed continues with its dubious claims that inflation is too low, but the markets and prices are saying otherwise. Buckle up, much higher prices are coming. The Fed is behind the curve again, just as it was in 2007. We all know what happened next. To take action to prepare for what’s coming… and start taking steps to insure that when inflation rips through the system you don’t lose your shirt.